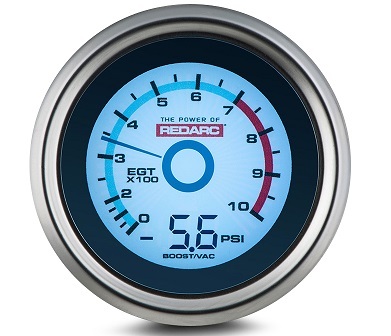 The REDARC 52mm EGT & boost/ vacuum gauge is a must for your diesel turbocharged vehicle. The G52-EU is used to monitor the exhaust gas temperature (EGT) of turbo-equipped vehicles in conjunction with a pyrometer probe. EGT is an indication of how hot the combustion process is in a vehicles cylinders. Excessive EGT can cause engine or turbocharger damage. Many conditions can result in excessive EGT (i.e. too much fuel or not enough air) and are made worse when a vehicle is pulling a heavy load, climbing or running at continuous high speeds. The vacuum feature shows the difference between outside atmospheric pressure and the amount of vacuum present in the intake manifold. This gauge gives you a guide to the engine’s mechanical health. It can give you information about problems such as engine rings, valves, leaking intake manifold gaskets, etc. By monitoring boost, you are also able to keep the vehicle's engine components in the proper power range to achieve the most performance from your vehicle. The gauge is supplied with a “K” type EGT sensor and electronic boost MAP sensor interface. The boost/ vacuum has a peak hold function with a display range from -12 to 23 PSI and programmable alert level between -10 and 10 PSI. The EGT function also has a peak hold function with a range from 0 to 1,000°C and is programmable between 500 and 800°C. The EGT probe has a 1/8” NPT compression fitting and is supplied with a weld in mounting bung. The G52-EU gauge diameter requires a 52mm hole for mounting. REDARC offer a range of mounting solutions including a 2” black plastic mounting cup (GH-CUP) and one (GH-MP1), two (GH-MP2) and three (GH-MP3) hole gauge mounting panels. Radio inserts are also available that suit the Toyota Hilux (GH-RI05). The REDARC 24 to 12-volt adaptor (GA-2412V) can be used to connect this gauge to a vehicle with a 24-volt ignition and lighting supply.